Old sewing machine - Guhl & Harbeck "Original Express". 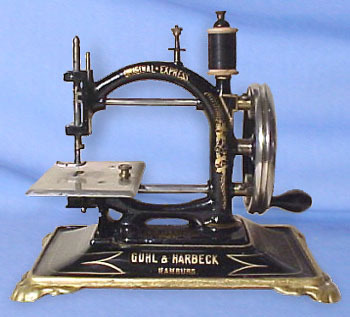 Guhl & Harbeck's "Original Express" chain stitch machine was possibly Europe's biggest selling rival to the Willcox & Gibbs. This particular example is in exceptional condition. Many surface today sporting alternative names, this being a result of large-scale rebadging within the retail trade at the time.